Soy protein, or known as soya bean protein is not easy to be atomized due to its high viscosity, it couldn’t be atomized well by normal high-speed centrifugal atomizer, and the investment is highly increased if use normal pressure spray dryer because it is too high. Furthermore, the feeding temperature of this kind of product is very high. As per these features, we specially designed the specialized combined spay dryer: with drying tower of centrifugal spray type (short in height and big in diameter), centrifugal air inlet distribution (spiral case with hot air distributor), and pressure nozzle (centrifugal atomization result is not good, and the product is not instant soluble, so we choose atomization under high pressure). With this structure, the investment is much lower, the same time, meet the processing requirements. 1). Type of spraying: adopt pressure spray drying, with high pressure pump which is specially designed homogenizer to provide high pressure. 2). Discharge type: all final products are collected from the cyclones, not from the bottom of the drying tower. The fluidity of soy protein is not good, and it is very easy to stick to the conical part of the drying tower, so we equip chain scraper with the conical part, which could scrape off the powder sticked on the wall. The powder fall down and will be transported to the cyclone(s) and collected there. The collected products will be sent to the packing room pneumatically, and will be cooled to room temperature during pneumatic transportation. 3). This kind of drying method could protect the active ingredient of the soy protein powder from being damaged. 4). Multi nozzles are used for spraying system. To avoid cross contact of the sprayed mist, the spraying area of the nozzles are specially designed, and the pressure nozzles are imported from United States or United Kingdom. 5). To avoid over pressure of the drying tower, there’s a vacuum protection device with the air inlet. 6). 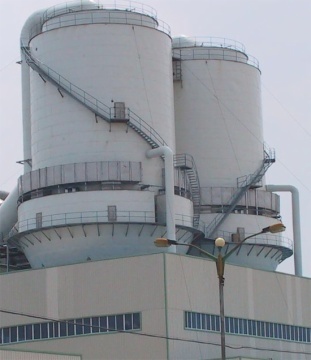 The hot air distributor is specially designed to avoid deviation of air velocity, make the air enters the drying tower uniformly in a spiral flow, so to ensure effective utilizing of the heat, and avoid sticking of the material onto the wall.